Any road trip to Leh is a journey of a lifetime. Most Indian travellers long to witness the barren beauty of its mountains against the the vast azure skies. Are you planning on doing such a trip or just dreaming about it? Whatever the case may be, we map out the road trip from Delhi to Leh and back again via two spectacularly scenic routes: via Manali and via Srinagar. Why is it Popular to Go from Leh Ladakh to Delhi by Road? Many travellers dream of such a journey, even if they can’t drive or ride. What makes this road trip so tempting? Of course, it isn’t just the destination; it’s that the journey to Leh provides a stunning backdrop, adventurous paths and exciting stopovers that make it perfect for a journey by road. So, let’s get started. Leh is inaccessible for most of the year, due to harsh weather and/or road closures. The right time to head there is between April and October if you’re travelling by flight, and May to September, if you would rather take the hard route and go by road. You’ve got four options for a trip from Delhi to Leh. The first, and easiest, is by air, and then there are three options, with increasing levels of difficulty. Flight: Direct flights to Kushok Bakula Rimpochee Airport take 1.5 hours. Bus: Buses starting from ISBT Station (via Manali) halt overnight at Keylong and reaching Leh the next evening. Personal car or bike: You could hire a bike or car in Delhi. Be sure to have a reasonable understanding of the mechanics of your vehicle. Bicycle: Many have succeeded in cycling all the way up. It may also make sense to put take your cycle along by bus from Delhi to Manali and then start riding from there. The most common route is via Ambala and Mandi. You will be driving along NH1 for the most part. The roads are initially very safe, but as you approach Ghanauli half way into the trip, the roads can get bad and the uphill climb begins. Gurubaksh Dhaba in Roopnagar is a great place to stop for a bite and to freshen up. Start out by 4 am from Manali to avoid the hordes visiting Rohtang Pass. On the way, you can see the iconic area, stop over at the Koksar Dhaba for lunch, put gas in the car at Tandi and head to Jispa. From Jispa, you’ll be headed to Sarchu, which is an important stopover. At an elevation of 14,500 metres, you can stay at the Army Base Camp from June to October. You’re almost there, once you leave Sarchu. But not before you traverse the Lachulungla Pass, from where you can see the entire Ladakh plateau. The rugged terrain then really begins, as you drive forward to Pang (where the highest army transit camp exists) and Tanglang La Pass (which, at 17585 feet above sea level, is claimed to be the second highest motorable road in India). By the evening, you will get to Leh. Food: Momos, thukpa, tingmo, qahwa are all available here. No fancy restaurants, of course. Camping: Plenty of camping places. Pangong Lake and Nubra Valley are favoured spots. Trek: Not easy to do, but the Chadar Trek is beautiful, taking you over many frozen rivers. Shopping: The Tibetan markets are great places to buy Tibetan items, foods and Pashmina. Wildlife: Many in the area will be looking to catch a glimpse of the elusive snow leopard. Museum: The Hall of Fame museum was constructed by the Indian Army to honour soldiers who died in the Indo-Pak wars. One of the highest altitude lakes in India, it looks spectacular and changes colour according to the sunlight quite a few times a day. Of course, a great camping spot, too. Ahead of Khardung La Pass lies the Nubra Valley, where there are hardly any plants here except near the beautiful river beds. Go a bit further and you will be in Diskit, where many Buddhist monuments exist in traditional Tibetan architecture. Magnetic Hill is a mysterious hill. Park your car at any spot and mark where it is. Check some time later and you’ll notice that your car has moved. A must-visit spot on your Delhi to Leh road trip. 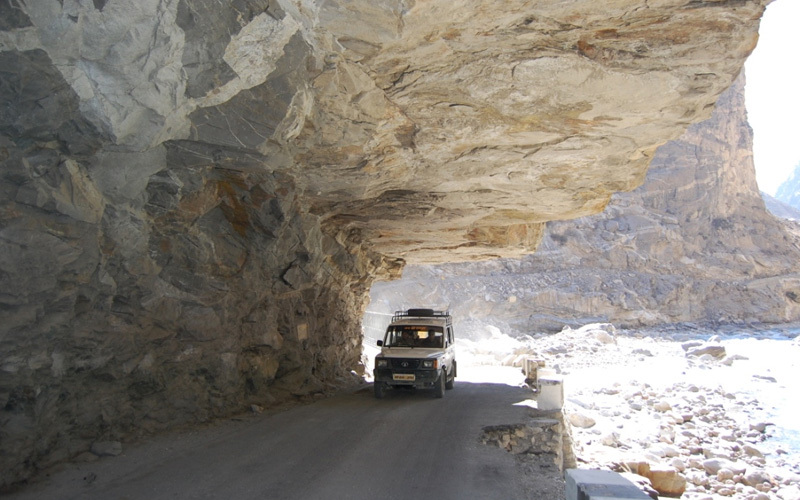 Once done, head to Khardung La, the highest motorable pass in the world at over 18,000 feet. Great for pilgrims, those interested in architecture or if you are sightseeing, the Thiksey Monastery or Thiksay monastery is a beautiful gompa (monastery) of Tibetan Buddhism religion, residing at the top of a hill. Your trip back, this time via Srinagar, will first take you to Lamayuru, where breathtaking vistas await. Do stop by at the world famous Lamayuru Monastery, occupied by over 150 monks. If you wish, do spend a night at Lamayuru before heading out for another long driving day. You will be passing through Foto La, Namika La and Mulbek to get to Kargil. Namika La is a mesmerising pass you will never forget. Your drive to Sonmarg will take you through Zoji La and Drass Valley, both excellent destinations. At Drass Valley, you could spend a few weeks even exploring nearby territories on treks. Zoji La’s road can be dangerous (be sure you’re alert at this point), but, once you get to Sonmarg, you’ll be greeted by lush green vistas. The onward drive to Srinagar is pretty and relatively short. If you’ve never been to Srinagar before, there’s plenty of things of interest. You should spend the night in Srinagar, as you will have a long drive ahead of you back home to Delhi. Your journey from Srinagar to Delhi should take you around 16 hours, with only a few stops. The journey is fun and the roads are good, compared to what you’ve just been through. There are plenty of good spots to stop and even spend the night along the way. The best one, of course, would be Amritsar, with its rich history and proximity to Wagah Border. Do not forget to try out Kesar Da Dhaba while there. And don’t forget to be safe! All the best on this adventure of a lifetime! Medication to control symptoms of altitude sickness. Do check with your doctor if you need any further medication. Don’t overwork your car at any point. Carry all the basic tools. Train yourself to do basic repairs. So that’s it from us on your Delhi to Leh road trip. We’ve taken you up to Leh via Manali and brought you back down via Srinagar. We hope you got all the information you were looking for. But if you have anything to add, don’t hesitate to let us know in the comments section.